This engine was sold by English Electric under the "Willans" name as this model was first built by "Willans and Robinson Ltd" under license to Rudolf Diesel in 1904. Diesel's innovation was to use the high compression of the air in the cylinder to ignite the fuel without the need for spark or hot bulb. He had to find a way to inject the fuel against the high pressure in the cylinder. The materials available at the time did not have the strength to build an injector pump capable of handling the pressure so diesel used a blast of high pressure air to inject the fuel. 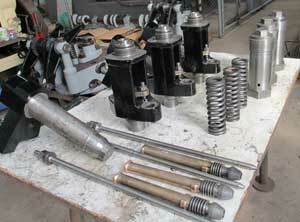 Diesel kept tight control of his patent and all licencees built to his basic design. 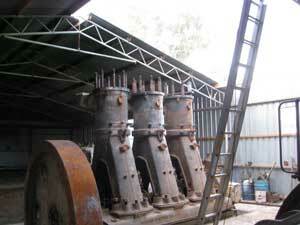 After Willans was taken over by the English Electric company they continued to build the engines into the 1930s. The club has now completed a very expensive exercise to build the massive foundation and work is beginning on installing this great example of original diesel design. The Willans is 250bhp @220rpm. It is direct coupled to an AC alternator which is beyond repair. When the engine arrived MSTEC was fortunate to have Frank Gough a very experienced diesel engineer as head of the section. Frank dedicated many months to fully restoring all the engine components. He sadly passed away before seeing the project completed. A Reavell quadruplex three stage compressor connected to the end of the crankshaft supplies the 900 psi air needed to atomise and inject the fuel. One of the crankshaft bearings needed grinding and when no gear was available large enough to accomodate the crankshaft it had to be shipped to Goltens in Singapore. 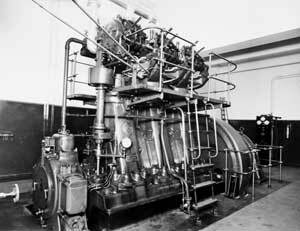 This engine and a sister engine were purchased by Carlton and United Breweries Ltd. in 1928 to act as standby generators. 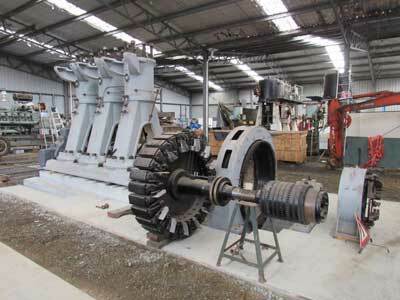 This one was installed at the Carlton and United Breweries Ltd Carlton Brewery driving a DC generator. 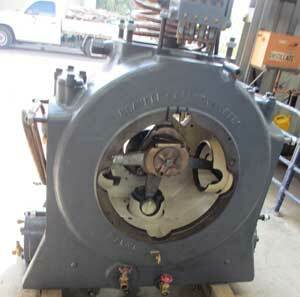 The generator was replaced by an AC alternator in the 1930s. By 1953 it had been moved to the CUB Yorkshire Brewery malting works. It was decommissioned following failure of the No. 2 connecting rod bearing in 1969. 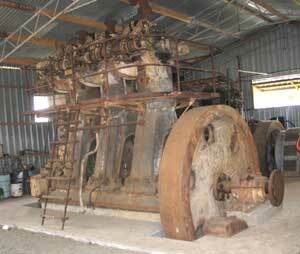 The engine sat there until 1982, when Ray Gillett, then a club member, aquired the engine dismantling and removing it. In 1988, Ray donated it to the Museum of Victoria, who hoped to erect it at the MSTEC site but the club had no shed space to house the engine and no funds for the installation. An offer came from the Puls brothers to house it in their Redhill museum which the Museum of Victoria accepted. It sat on static display in the Puls’ museum until 2010 when the museum closed. The Puls donated the engine to the club provided the club paid the costs associated with the move. This included removing and replacing the roof of the shed that had been built around the engine. Cranes and trucks were hired and a small team got the engine back to the club. 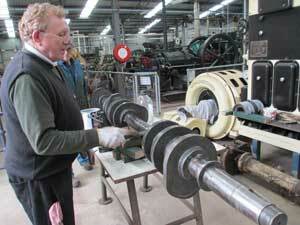 Countless hours went into the restoration of the engine components but the aim is to have it operational. The engine required a massive foundation and thousands more hours and great expense went into it. 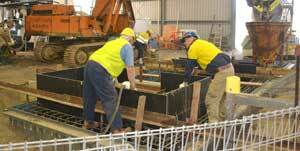 Warwick Bryce and Bill Dazenko each put over 1000 hours into the construction and many other members assisted. The foundation is based on the installation design stipulated by English Electric when the engine was delivered but is complicated by the nature of the soil on the Steam Centre site. 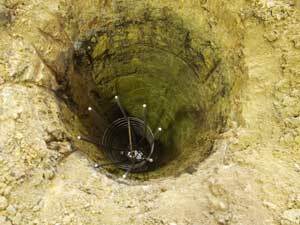 Soil tests indicated problems with site necessitating piers sunk 5 metres down to solid supporting mud stone. 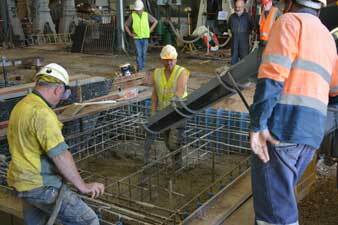 The pit for the foundation was then excavated and lined, then a blinding layer of concrete was poured. 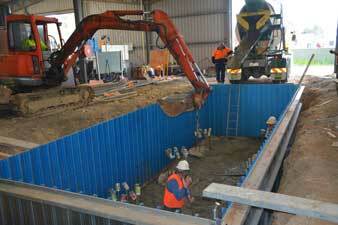 Finally the above ground plinth was boxed up and poured. All foundation work was completed and the engine loosely assembled just in time for the club's 50th rally.